Gone are the days when the only way you could draw water out of a deep or shallow well was through a rope. With the advancement in technology in this fast-paced modern generation, convenience is always at the table, it is a matter of choices. With the invention of submersible well pumps, you can draw water as deep as 90ft below the ground at the touch of a button. 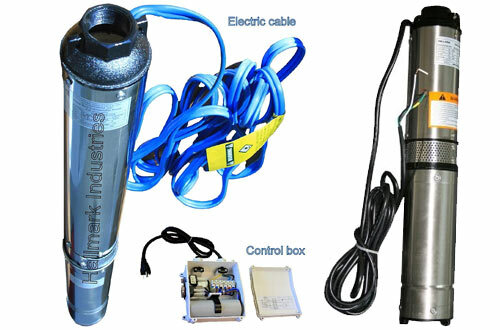 Well, that is how submersible well pumps have made our lives easier and convenient. If you intend to purchase one, I would deny the fact that choosing the best model out of a thousand plus can be such a bewildering task. However, we are here to ensure you make a worthwhile purchase and that is why we have reviewed the Top best Submersible well water pumps you can find in any corner of the market today. Check them out and let’s hope this post helps you make the right and the most appropriate decision. 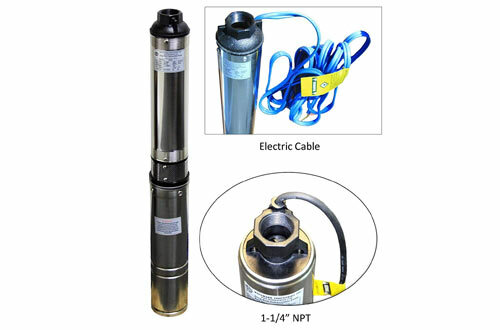 Top on our list is the durable deep well submersible pump from the reputable Hallmark Industries. 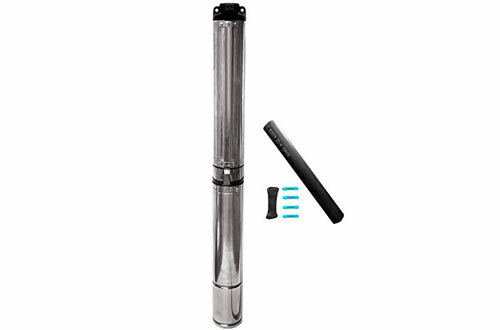 It is one of the best submersible well pumps you can lay your hands on. The Hallmark MA0343X-4 is a high-quality 1/2HP 60HZ Deep well pump that can be used with any 4” or bigger wells. Built to American standards, this unit never disappoints whether used in an industrial or domestic setting. Built-in thermal protection increases the lifespan of the pump while the built-in control box eliminates the need of an external box during installation. Working on a nominal voltage of 110V – 130V, this pump has a max head of 150ft. Kindly note that this unit will pump water to an open tank and not a pressure tank. 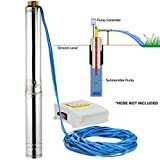 Overall, it is a reliable submersible well pump that lasts and is worth every penny. This is another adorable deep submersible well pump from Hallmark Industries that does a pretty decent job. Designed for 4” or bigger wells, the 2-Wire pump has a built-in control box and is suitable for both industrial-grade or domestic usage. The major difference between this unit and the Hallmark MA0343X-4 is that it operates on 230V and can pump water at up to 33GPM. For long-lasting durability, it has built-in thermal protection and most parts are constructed of stainless steel and thus rust-resistant. The motor is hermetically sealed to prevent damage or malfunction that can be caused by overheating. Other robust features include the 1HP Capacitor Start and the built-in check valve. 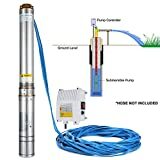 Overall, whether you intend to put in into industrial or home usage, this deep submersible well pump works great. Another top-rated model from the reputable RED LION is the RL12G05-2W2V Deep Submersible Well Pump that boasts several prominent features. Designed to work with 4” or larger wells, this 2-Wire unit can operate as deep as 250ft but is more suitable for use with well water depths of 100ft. To ensure optimal pump stability and prevent soil particles from coming near the bearing surfaces, this system a large-surface Hex rubber bearing. The built-in suction screen prevents debris from clogging the impellers, the reason it doesn’t require servicing regularly. Plus, the built-in check-valve prevents backflow and helps maintain optimal internal pressure. Despite being a 1/2HP Deep Well Pump, you won’t believe the durability and the strength of this pump. The thermostatic discharge head enhances versatility and prevents corrosion. 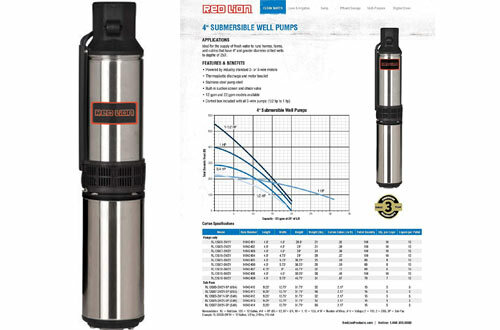 For a versatile and a solid-performance deep submersible well pump, the Red Lion RL12G05-2W2V Pump makes a great choice. Despite being a heavy-duty industrial grade submersible well pump, the Hallmark Industries MA0431X-18A-E can still make a great home pump. It operates on 230V and can pump water at a flow rate of up to 35GPM. One adorable aspect of this pumps is the stainless steel body shell that is durable and rust-resistant. Plus, this pump has a heavy duty cast iron discharge. No more priming among other expenses, this pump is submersible and operates quietly. Hermetical sealing protects the motor and prevents overheating. Patented impellers boost efficiency and prevent clogging caused by foreign particles. 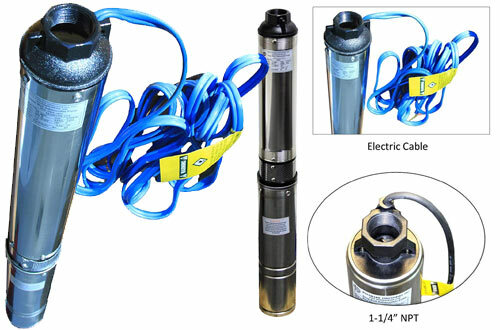 Other prominent features include the NPT discharge and the built-in 3HP Capacitor. 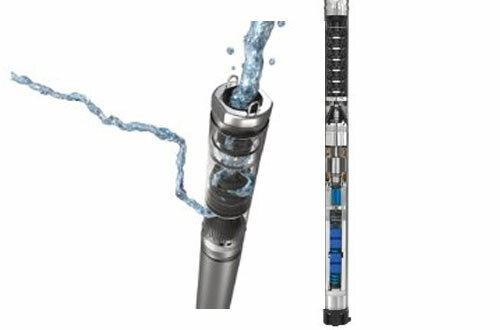 For a reliable water supply all times, the Grundfos 10SQ05-160 Submersible Well Pump beats most of its competitors. Unlike other models, this unit has advanced features such as dry run protection among many more. Coming with a magnetic motor, this system operates pump heads up to 200m and is highly efficient. When connected to a Grundfos CU 301 Control box, this system makes the perfect choice for intermittent and continuous water supply. Kindly note that the SQ is a compact 3” multistage centrifugal pump that cannot be used in a borehole that is larger than SQ itself. It is a 2-Wire Plus Ground motor capable of operating at a flow rate of up to 10GPM. Overall, it is a great choice that is reliable, easy to install and friendly. This is a heavy-duty workhorse that will keep water flowing in your home, farm or cabins without any disappointments. Engineered with a built-in thermal protection, this unit operates at a maximum temperature of 95°F in order to prevent damage or malfunction to the entire system. It is a 2-Wire Plus Ground Design unit that is easy to install and energy efficient. More impressive is the stainless steel construction that enhances the lifespan of this pump and optimizes functionality. The built-in valve check prevents water from flowing backwards and keeps the velocity steady. Kindly note that this unit can be used with any well that is 4” or bigger. It also doesn’t require an external control box, a crucial factor in installation. True to its name, the LOVSHARE is another excellent deep submersible well pump that will meet all your water demands. Stainless steel impellers extract water from groundwater for longer than you would expect. Despite featuring a compact footprint, this unit works great when dived deep into the water with its 131ft cable. The great point of this pump is the fact that it can be used in oil wells, ash pipe wells, and steel pipe wells. Stainless steel construction gives this unit a heavy-duty design that is durable. The built-in check valve prevents improper water flow and keeps steady the velocity. 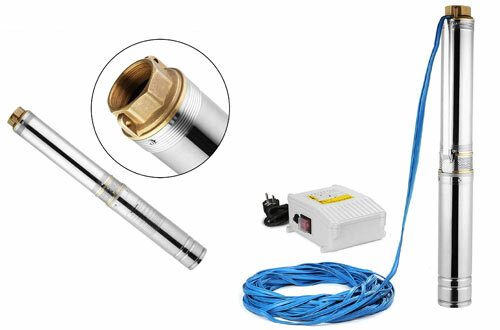 Overall, for extraction of deep underground water, LOVSHARE Deep Submersible Water Pump makes a great choice. 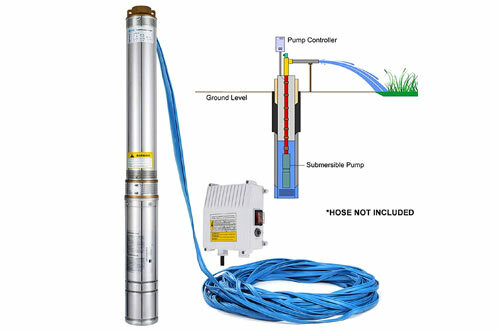 Eight on the list is the LOVSHARE Submersible Deep Well Pump. It can be used with any well whose diameter is 100mm. 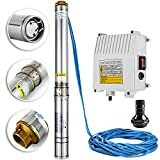 Unparalleled versatility is well expressed in this deep well pump, depending on the flow pressure, you can use this unit with a hose, plastic or steel pipe. Coming with a control box makes the installation hassle-free, you don’t need extra room. Expect excellent durability and functionality owing to the stainless steel body and the built-in check valve. For up to 70m water depth, this unit still holds up whether used in an industrial-grade setting or just at home for basic domestic purposes. It is a great option when you want to water your crops or use it for draining purposes. Coming with a wire splice kit, this is one of the favourite submergible deep well pumps that are worth the consideration. 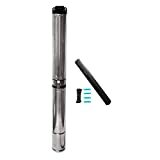 Designed to be used with any drilled well as long as it has a diameter of 4” or bigger. It is a robust workhorse that stands the test of time and does a pretty decent job. You can be sure your cabins, farms or your rural home won’t run out of the water. It features a 2-wire Plus Ground Wire Design to optimize energy conservation and easy provision. Most adorable aspect is the patented impeller design that steads the water flow and increases the lifespan of the pump. Built-in thermal protection works to ensure the pump’s temperature does not exceed the maximum 95°F limit. The built-in check valve prevents backflow of water which can affect the performance of the impellers. Installation of the pump is a breeze. This is another outstanding model from LOVSHARE that packs a massive 22GPM flow rate despite having a small footprint. It can be used in any well of 4” diameter or more. The submersible 110V Pump requires a hassle-free installation and doesn’t require a pump room. It boasts a stainless steel body and thus capable of withstanding harsh conditions for ages. Even better is the fact that you can use this pump with a steel pipe, plastic or hose pipe as long as the pressure allows. Built-in check valves protect the impellers by preventing backflow of water. 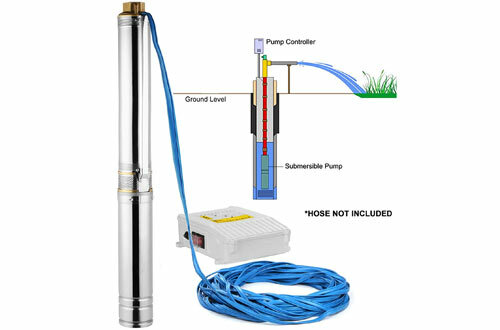 The system comes with a 32.8ft cable and can dive deep into groundwater. At maximum, the pump head is 100M. Overall, this machine works great when used in an industrial-grade setting or at home for regular farm and domestic needs.